What’s better than waking up to crisp morning air, the smell of freshly sharpened pencils and pumpkin spice lattes? The sound of “This is just what I wanted. I love you!” from your little ones on Christmas morning. Can it really be time to think about the Holidays? Before we know it Halloween will be gone and Pumpkin Spice Lattes will be traded for Eggnog Lattes. Long lines and crowds are something I plan to avoid this year, along with staying up until the strike of midnight to steal the hottest “must have toy” from my neighbor’s hands. Kmart’s Fab 15 Toy List, which debuted this week, answers the question featuring this season’s “must have” toys for kids 18 mos – 8+. Here’s a sneek peek at the list: Furby Boom, Holiday Barbie, LeapPad Ultra & Rescue City Center. Great list but, with only 6 paychecks left before Christmas, how to pay is a real issue. Say hello to FREE Layaway @Kmart, making your wallet, and your little ones, happy. The hottest toys of the season and free layaway is a good combination but Kmart’s making it great for us this season. This year, Shop Your WayMembers have more time and chances to stuff stockings and pile presents underneath the tree. 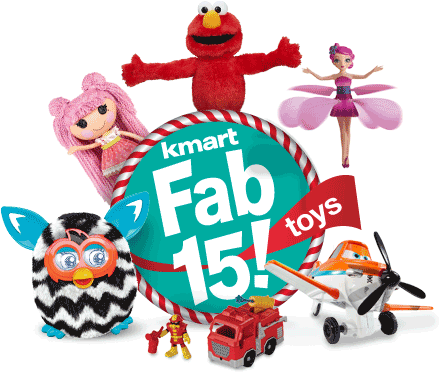 The Kmart Fab 15 SWEEPS is giving Members free toys every week and one lucky Member will win the grand prize: the entire Fab 15 toy list! Must have toys, free layaway and a sweeps to win the entire list? It’s time my pumpkin spice latte and I visit @Kmart!